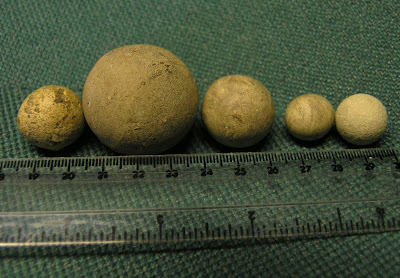 These hand-made ceramic balls were found in the Watton garden of Chris Woods, they measure between 24mm and 16mm. A natural round flint (far left) was found in the same area. It is suggested that the ceramic balls are home made marbles. Have you found anything like it, or have any information? Marble-like games have been played for thousands of years. In Austria small round stones were found in the 4000 B.C. grave of a child. Small hand-made fired clay balls have been found in the tombs of ancient Egypt and nearly every part of of the ancient world. Both the Greeks and Romans played a version of the game of marbles, a painted Roman mural in Bath shows children playing marbles. The game is mentioned in a French poem of the 1100s, and marbles of coloured glass are mentioned in German literture as early as the 1400s. There is a painting of 1560 by Pieter Brueghel the Elder 'Children's Games' shows a game in progress. There is an account of 1694 of 62,200 marbles 'for boys to play with' being imported from Holland. Stone, agate and real marble marbles were produced in special ball mills in Germany from the 1700s. The market for marbles led to the patenting of a 'Machine for making marbles for children' in 1788. Glazed china marbles were introduced in around 1800. The first known printed book on the game was published in english in 1815. A german glass worker is thought to have invented the marble scissors in 1840s, which were used to mold the molten glass into balls. Clay mabled where mass produced in the 1870s, and in 1890 the first high production machine made glass marbles were produced in Germany and shortly after in the USA. It was not until 1950 that the classic cats eye marble was created in Japan, by injecting colour glass in to a clear molten glass. Before starting a game of marbles, players should agree whether they are playing for 'keeps' or not. 'Keeps' means that a player who wins a marble may keep it. Generally you win an opponent's marble by striking it with your own. On occasion, players may agree to play for 'keeps' for certain types of marbles, but not for others, in which case, they may substitute other less valuable marbles for the one won. This game can be played by any number of players and the marbles shot can be any size. An order of play is decided. The first player throws forward a marble to a distance of their choice, usually the distance that he throws best at. The second player then shoots at this marble. Hitting the marble means winning it, but if he misses, he will then throw a new marble to restart the game. If he misses it, however, this marble (the one just thrown) remains in the field. A third player may shoot at either marble, capturing it in the event of a hit, but leaving the marble in play if he misses. A marble shot with force which bounces off several marbles in the field will capture all those which are hit. If a player chooses an expensive alley, he may have the advantage of accuracy, but may stand to lose it in the event of a miss. This is a game for any small number of players. Each player gives one or more marbles to a straight line of marbles spaced so that there is room for two marbles to pass through the gaps. Each player then shoots in turn and may keep any marbles he hits. The player's taw remains where it lies at the end of the turn and subsequent turns are played from there the taw lies. A player whose taw is hit by another taw must add one marble to the line. This is one of the best known and most popular of all marbles games for a group of players. Two circles are drawn on the ground. The inner circle should be about 1ft (30cms) in diameter and the outer should be about 7ft (2m) diameter. The players each put an agreed number of marbles into the inner ring. The order of play is decided and the players take turns to shoot their taw from any point on the outer ring at the marbles in the centre. Any marbles knocked out of the centre ring are pocketed by the shooter and he is entitled to shoot again from the spot where his taw lies. 'Sticking' or shooting all marbles out of the ring consecutively and winning the game without giving an opponent a turn is usually good for two days of playground bragging rights. When a shot is unsuccessful, play passes to the next player and the taw remains on the ground where is lies, if that spot is within the outer ring. The next player may then shoot at the marbles in the centre or at any of the opponents' taws. If he strikes a taw, its owner has to pay him one marble and he takes another shot. The shooter may not strike the same opponent's taw twice in a row. The game continues until the ring is cleared. The name comes from the use of real stone marble chips that were used to the balls in the 1700s. They are also known as 'alleys', 'taws', 'merps', 'marvels' and dobblers. The best marbles are known a 'alleys' (said to be so called as they were once made of alabaster) which are prized for their accuracy. A 'taw' or a 'shooter' it the marble being used by the player. The names of marbles and the rules of the game can vary from village to village. Do you remember what you called your marbles and the rules of the game you played? click on the word COMMENTS below to leave a message, please say where you come from and the decade you are talking about. It will be interesting to see the diffrences between the villages and the times. was enjoyed by those that attended the Merton Church Open Day. 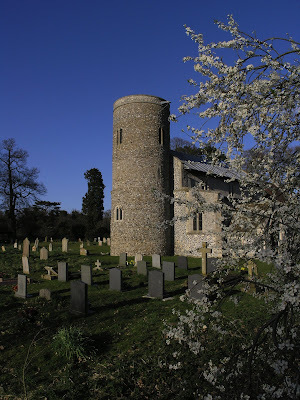 The view from the churchyard of the hall and mere must be one of the most beautiful in Norfolk. 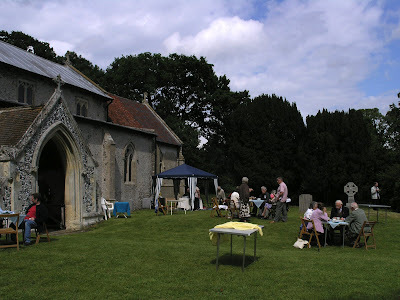 The next event the 'Capturing Our Wayland History' stand will be is at the Merton Church Open Day on 21st June (midsummer's day) from 12 noon to 5pm. Come and discover some of the church's fascinating history and see a slide display of images of Merton in the past by Tony Brooks. Try your hand at Brass Rubbing. Light lunches and teas available. It is a very beautiful round towered church in a wonderful location within Merton Park. The Fete and Fair Season is in full swing, following the Horn Fair at Hockham, the project had a stand at the History Fair at Gressenhall, where the Scoulton History Group put on a display of their research. The project gazebo and I have travelled to the fates at Caston, Ovington and Watton carnival over the last two weeks. The project has had a very warm and friendly welcome every where it has been. 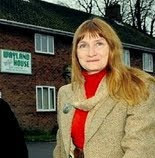 A great amount of interest has been shown in the project, which is reflected in the number people that have signed up to take part in 'Capturing Our Wayland Heritage'.